3 months Chess King LEARN subscription, giving access to all courses available there (60 as of Dec.2017 and counting)! The courses are available in 9 European languages, sorted by category and difficulty level, and include such gems as Chess Tactics for Beginners 2.0, Chess: From Beginner to Club Player, Chess Strategy,Chess Middlegame series, several courses from CT-ART and Chess Tactics in the Opening series and more. 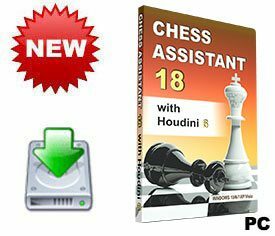 Chess Assistant 18 with Houdini 6 is a unique tool for managing chess games and databases, playing chess through the Internet, analyzing games, or playing chess against the computer. 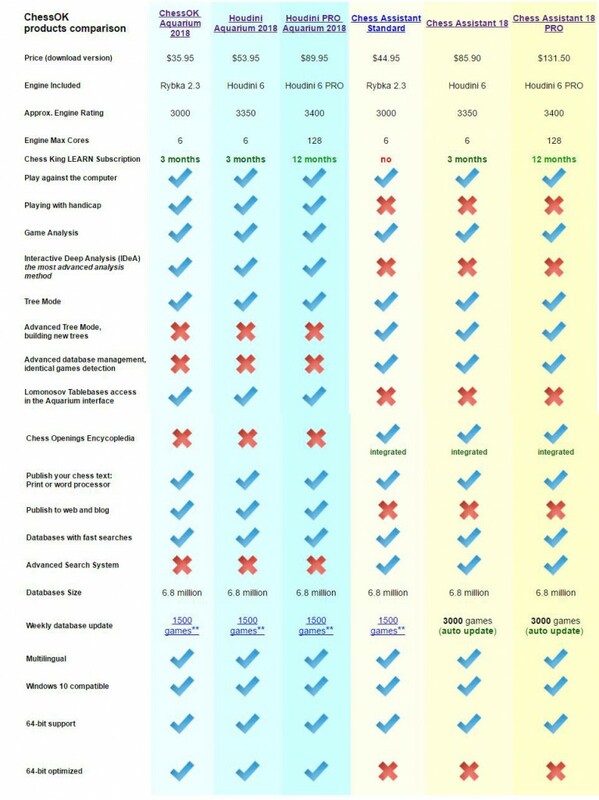 Chess Assistant 18 includes grandmaster level playing programs, Chess Opening Encyclopedia mode, a powerful search system, the unique Tree mode, databases of about 6.8 million games in total (Nov. 2, 2017) that can be automaticaly updated 3000 new games every week for free, 3-months access to all courses at Chess King Learn and to 7-piece Lomonosov Tablebases at tb7.chessok.com and more! Chess Assistant 18 is a unique tool for managing chess games and databases, playing chess online, analyzing games, or playing chess against the computer. The Professional Package includes the best chess engine – Houdini 6 UCI, Chess Opening Encyclopedia, a powerful search system, a unique Tree mode, databases of 6.8 million games in total (as of November 2, 2011), 1-year Premium Game Service (3000 new games each week by Internet), twelve months of free access (1-year membership) at ChessOK Playing Zone and much more. Chess Assistant 17 comes with the Houdini 6 chess engine. Houdini 6 leads most independent computer chess rating lists. No serious chess player can be without Houdini 6! Chess Opening Encyclopediacontains rich theoretical material on all openings. It contains over 8.000 annotations from GM Kalinin and 40 million evaluations by the strongest engines. The detailed key system for all openings can be edited to suit your needs.Opening Tables is a revolutionary way of creating, maintaining and studying your opening repertoire. Base your studies on the Opening Encyclopedia, customize it with your own moves and evaluations, enhance your favorite variations or create your own private opening repertoire. Working on your opening repertoire finally becomes the creative and enjoyable task it should be! ChessOK Playing Zone. The Playing Zone is an advanced chess server that supports anything from bullet and blitz to correspondence play.The ChessOK Playing Zone is absolutely free.In addition to playing online you can watch games from the most important chess events on the Playing Zone, with live Houdini 2 analysis.Internet Chess Club (ICC). Chess Assistant comes with a graphical user interface to the Internet Chess Club (ICC), which supports variations, engine analysis, and online annotation. Chess Assistant 18 comes with 3-months access to all courses available at learn.chessking.com.